Singer, songwriter and guitarist, Carl Cleves, would, even as a child, entertain his siblings and schoolmates with his vivid imagination and captivating stories. After many requests from his friends and fans, Carl decided to write a book. 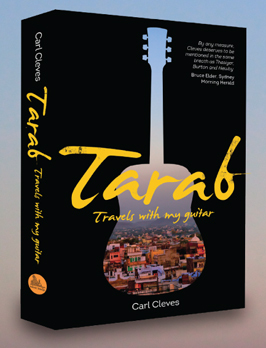 TARAB narrates the adventures and quests, wanderings and narrow escapes, mishaps and illuminations of guitar-toting troubadour and songwriter Carl Cleves in his many roles as young beat poet, law student, single father, journalist and ethnomusicologist, inmate of hospitals, relief worker in cyclone-struck India, antelope trapper in Uganda, encyclopedia salesman in Bangkok, ‘back to the land pioneer’ in Australia, band leader and recording star in Brazil. This memoir runs over three decades and includes quests with his "she was not a screamer" partner Beatrice, during the revolutionary independence years of the late sixties in Africa and on the hippy/ spiritual trail in India in the seventies; escapades with his young son Tashi during the eighties in South America and North Africa; tales of calamities and survival set in the interior of Brazil, the Himalayas and on the east coast of Australia. From the Sudan to Northern New South Wales, Tarab is an epic, mesmerising tale of high adventure and the search for meaning. 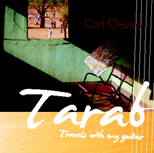 Cleves’s page turning memoir is no simple music biography, but rather the travel story of an artist’s quest for tarab: a place where music and poetry bestow true bliss upon the lucky one. It’s by turns philosophical, funny, adventurous and insightful. Fully revised and expanded, this new edition of Tarab is a must read for all lovers of travel literature. It includes Cleves’ time in Sydney working at the late Petersons’ Music Shop in George Street and his early years living in Northern New South Wales at the height of the back to the land movement. The crack of dawn the truck will go." As a child of devout Catholics I prayed at the open window of my bedroom that Peter Pan would come and whisk me away to a magical jungle in a snow-peaked mountain range. The Belgian comic strip hero Tintin, or Kuifje as he was called in my native Flemish, was my saint. 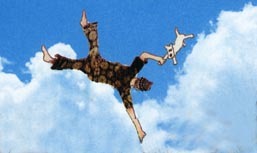 Intrepid, courageous, optimistic, pure of heart, loyal, caring of his dog Milou, Tintin travelled the world. In many places I saw his footprints: in the streets of Kathmandu, in Balkan villages, in the favelas of Rio de Janeiro and the bazaars of Arabia. "The Temple of the Sun" was my favourite book. Set in the heart of South America, it told the story of an unswerving quest to rescue a friend, an amazing journey across snow-capped mountain peaks and raging streams, beneath towering rainforests, amongst the remnants of the Inca Empire and the downtrodden Indians who populate present-day Peru and Bolivia. My prayer was about to be answered. 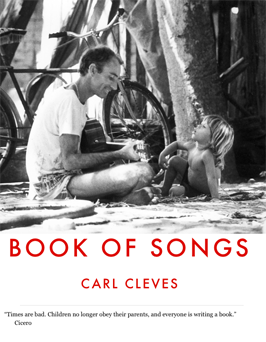 In this original musical biography Belgian-born Carl Cleves, author, songwriter and musicologist, lets 55 of his poetic song lyrics prompt a rollicking road story, a confession, a personal history, musical insight, philosophical musing, a brief essay or a spirited escapade. Whether at a reburial ceremony in Madagascar, a murder in Bethlehem, on the road in the back country of Brazil, busking in Barcelona, at a press conference in Madagascar, lost in Leipzig or seeking oblivion in the Pacific islands, 'Book of Songs' will enchant lovers of music, travel and whoever believes that dreams can be made real. This edition provides over a hundred photos and illustrations, while hyperlinks refer to audio files of songs and live video clips. His first book, ‘Tarab: Travels with My Guitar’ (Transit Lounge), an epic, mesmerizing tale of high adventure and the search for meaning, has become a travel adventure classic. Now 'Book of Songs' reveals the sound track behind the adventures, the stories behind the songs. It is the perfect accompaniment to ‘Tarab’. You will need a Mac computer or iPad. Go to iBooks: Carl Cleves ‘Book of Songs’. ‘Tarab’ is now also available in digital format.